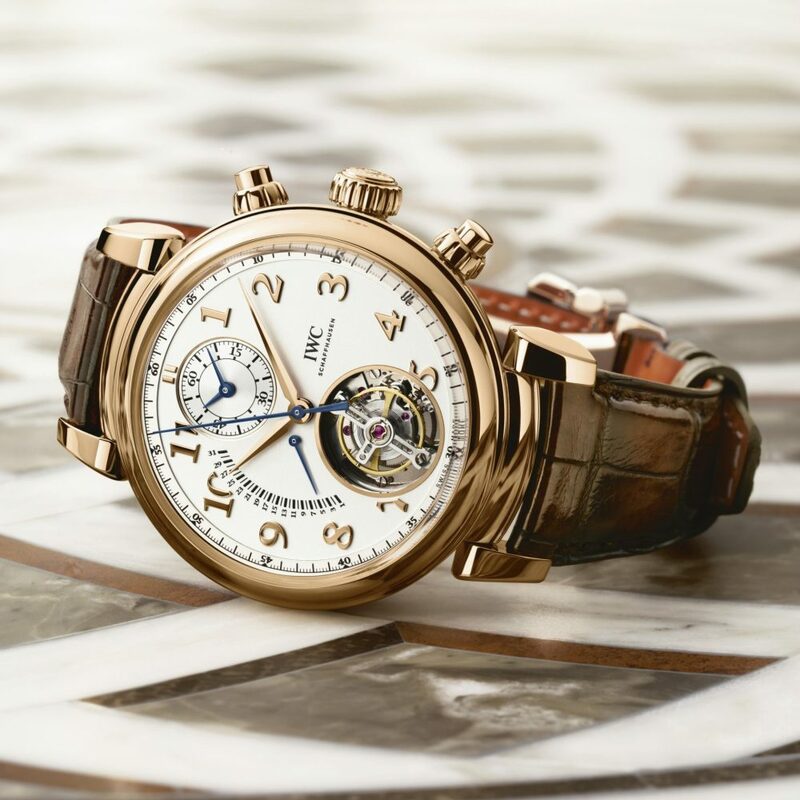 lifestyle /Horology IWC Da Vinci Tourbillon Rétrograde Chronograph Chronograph, tourbillon, retrograde date: thanks to its newly designed IWC-manufactured movement, this masterpiece of haute horlogerie unites three complications on a single dial. The name of the Da Vinci Tourbillon Rétrograde Chronograph alone reflects its unique status: on a single dial, it features a combination of a classic tourbillon, a chronograph and a retrograde date. IWC’s watchmakers have designed the new in-house 89900 calibre to make this distinctive constellation possible. The most conspicuous feature of the 18-carat red gold Da Vinci Tourbillon Rétrograde Chronograph (Ref. IW393101) is the flying tourbillon. The tourbillon cage is bearing-mounted only at one end, on the underside, and is not connected to an upper bridge. The tourbillon also features a technically complex hacking function that guarantees down-to-the-second accuracy when setting the watch. When the crown is pulled out, two levers grip the balance rim like a clamp and block the mechanism consisting of the balance, wheel train and hands. New geometry in the pallet and escape wheel combined with diamond shell technology ensures that the watch’s 68-hour power reserve when fully wound is maintained despite the additional complications. Furthermore, the pallet and escape wheel are made of diamond-coated silicon, an extremely hard surface with good sliding properties that reduces friction and thus resistance, which in turn benefits the power reserve. The chronograph function at “12 o’clock” allows stopped times of up to 11 hours and 59 minutes, which can be read off as easily as the time of day. The central seconds hand measures stopped times to an accuracy of one-quarter of a second. Retrograde for a more vivid sense of time The third complication, besides the chronograph and the tourbillon, is the retrograde date display, located on the left-hand side of the dial. The hand shows the date from the 1st to the 31st of the month as it moves across an arc and then, at the end of the scale, reverts to its starting point. In months with fewer than 31 days or when the watch has not been used for a while, the date display can be advanced rapidly and conveniently using the crown. Compared with a traditional date window, the analogue display turns the passage of time into a much more vivid experience. Harmony through balanced design The Da Vinci Tourbillon Rétrograde Chronograph’s precious red gold case with golden push-buttons and lugs has a carefully balanced appearance. The movable horns ensure that the dark brown alligator leather strap by Santoni with its 18-carat red gold folding clasp fits perfectly around the wrist. The harmonious arrangement of the three complications on the silver-plated dial, with the chronograph function at “12 o’clock”, follows the typical IWC pattern. The watch, which is water-resistant to 3 bar, has a transparent sapphire-glass back. Looking through it, we see the new IWC-manufactured 89900 calibre with its solid red gold rotor. The watch is 44 millimetres in diameter and 17 millimetres high.